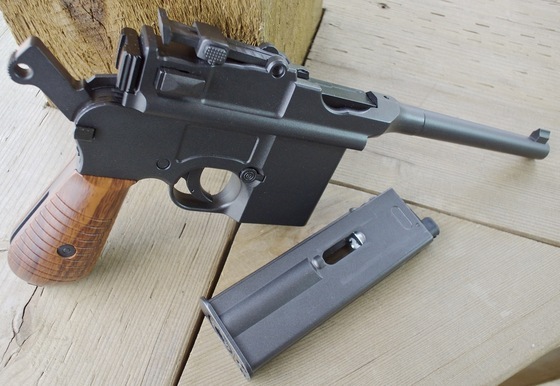 I've already done a full Table Top Review that included a Pre-test for this war pistol replica where you will find more details and specifications for the KWC Mauser Airsoft pistol. In this official Field Test Shooting Video, I do my standard Chronograph test where I shoot a series of .25 gram 6mm Plastic Airsoft BB's using a brand new CO2 cartridge to see what kind of real word Feet Per Second performance I can get out of the KWC Mauser CO2 Blowback Airsoft Pistol. On this medium temperature day I averaged a very quick 415 fps which may be a bit hot for most Airsoft matches. The temperature was fairly cool at 14 Celsius or 57 Fahrenheit so the fps will only get faster on a warmer day. During my Accuracy Shooting Test, I set myself up 30 feet away using a semi-rested stance (Sand bag up front, standing in the back). I did have to adjust my rear sight to the lowest position and even then I found that I needed to aim at the lowest ring on the target to get my shots close to the center and even then they placed a bit high. Even though the KWC Mauser Airsoft Pistol shot high the results where very good, resulting in a 10 shot grouping in the 1.5 to 2 inch range! 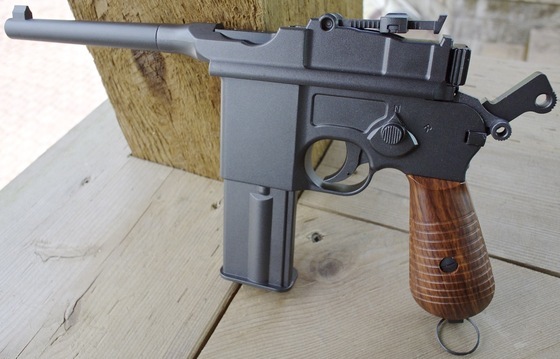 Overall I really enjoyed shooting the KWC Mauser CO2 Blowback Airsoft Pistol, the trigger is super nice and short with a light single action release. The blowback action is very quick and snappy which really makes the full auto rate of fire very high. You will go through a 21 round magazine in a hurry! It is a sample or prototype pistol and I would imagine that KWC could work on getting the FPS juts a bit lower so it would be more usable in an Airsoft Game, and while they're at it they should bring the shot placement down just a bit. Other than that it's a really great Airsoft War pistol replica worthy of addition to anyone collection.